A heated floor in your bathroom, kitchen, mudroom or any room where you spend time can make a big difference to your comfort levels in the home. 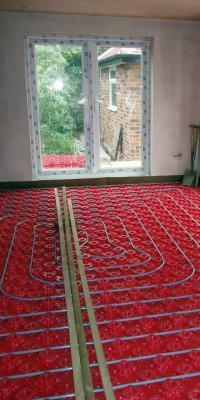 There are several ways to get a heated floor, including radiant heat provided by electric cables. 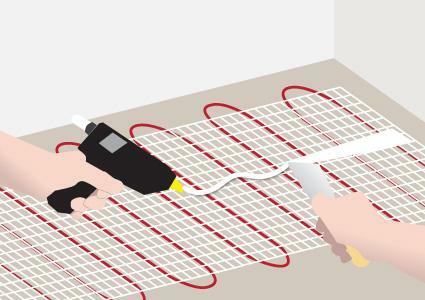 Install these radiant heat cables yourself whether in a new home or during a renovation; they go down right before the final flooring and are wired into your home's electrical system. The process of installing radiant heat cables is the same no matter the age of your home. For the best results, begin with a level, new substrate of cement backerboard. In older homes, this may mean ripping out your existing flooring and possibly installing a new subfloor or substrate. Electric cables are sold in pre-cut lengths; you cannot cut or modify the cable in any way once it arrives. Therefore, to make sure it will fit the room you are installing it in, make a template of your floor and contact the manufacturer. To make a template, take careful measurements of the floor and transfer them to brown craft paper cut and taped to the exact dimensions as if it were a wall-to-wall carpet. Send this to the manufacturer. They will cut your wire and send you back a detailed plan on exactly where in the room you will lay the cable. SunTouch: SunTouch makes several different types of cables and mats. They will walk you through which one will work best for your home and comfort level for installation. InfraFloor: If you want your floor done fast, contact InfraFloor. Their products are in stock and ready to ship. They also have a special adhesive tape that eliminates the need for glue during installation. MasterHeat: MasterHeat carries a large selection of different sizes of mat; no customization necessary, so their prices and lead times are shorter than other manufacturers. NuHeat: NuHeat's mats are thicker than the others and aren't rolled and cut. Instead, they make a mat right to the shape of your room so all you have to do is lay it down. Lay out the cement backerboard on the subfloor in the room in which you will install the radiant heat. Keep each board 1/8-inch away from the perimeter of the room and from each other. Cut the boards to fit the room by scoring their surface with a utility knife and snapping the boards. Take the boards up from the subfloor and spread a layer of thinset mortar onto the subfloor with a trowel. Press the backerboard back into place in the same order you laid it out in originally. Screw the backerboard down to the subfloor every 6-inches using backerboard screws and an electric screwdriver. Sink the heads of the screws just below the surface of the backerboard. Apply fiberglass tape to the seams of the backerboard and skim coat each seam with mortar and a trowel. Let the mortar cure for 24 hours. Unroll the electric cable and the mesh that joins it together. Find the ends and connect them to a volt-ohm meter. Check the reading on the meter against the numbers sent to you with the wire. They should match. If they do not, do not install the wire. Contact the manufacturer instead because the wire may have been damaged. Run the ends of the wire to the wall where the GFCI outlet and thermostat will be located. This is where you will begin rolling out and laying the wire. Roll out the mats of wire according to the plan sent to you by the manufacturer. 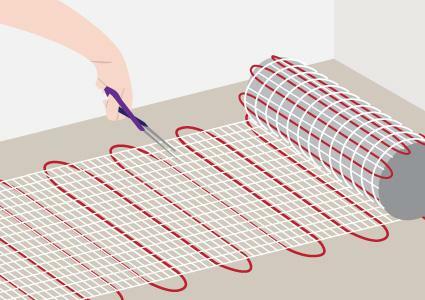 The mats can only travel in one direction; when it is time to switch direction, carefully cut the mat around the wire and turn the mat 90 or 180 degrees. If you need to go through a doorway or another narrow area, cut the mat away from the wire completely and arrange the wire in a serpentine pattern through the narrow area, then continue rolling out the mat. Keep the mat at least 3 inches away from the walls and any obstacles in the room as well as away from any areas where you do not stand. Roll the mat and wire out to its full length and tuck the end of the wire along the wall. Reconnect your wire to the volt-ohm meter and check the numbers against the second set provided to you by the manufacturer. If they are the same, begin gluing down the mat. If they have changed, contact the manufacturer. Heat up your glue gun and run a bead of hot glue down the center of each mat. Spread the glue out with a putty knife to help secure the mat in place. If you have any loose wire you pulled away from the mat, glue the wire down right to the backerboard. Test your wire on the volt-ohm meter again to ensure the numbers have not changed. Install your tile or flooring right on top of the wire and mats and test the wire a final time, matching it to the third set of numbers provided by the manufacturer. Have an electrician fish the wire and connect it to the GFCI outlet and the thermostat you will use to control the temperature of the floor. Most home inspections do require that a certified electrician do the mat's hook up; in both new construction and renovations, a permit will result in an inspection, so be sure to have an electrician's help at this point. Radiant heat will transfer from your floor to the objects touching it, such as your feet or furniture, making the entire room feel warm. Enjoy the warmth of your new radiant heat floor and find new comfort in your home.